Galaxy M20 has a huge 5,000 mAh battery this is the second time ever that Samsung used such a high capacity battery on their phones have a 5,000 mAh battery on the phone does not always guarantee good battery life. But you can be sure that you will get at least more than a day of juice out of the device. Now upon considering this is a budget phone with a processor that not resource hungry, I can almost say with certainty that this device will go 2 days at least without you need to plug it back again. The Samsung Galaxy M10 has a 6.3 Inch full HD+ display. When you think about it the iPhone 10 R which costs 750$ in the united states and with 1000$ in India has an 828 x 1792 pixels display and this phone which only cost 150$ dollars has a full HD Plus display. It also has a notch display but many peoples don’t find this useful. This device only cost 150 bucks and it’s less intrusive than some of the bigger notches out there. So, I guess it’s only fair not to complain about it. This device also comes with fast charging support and most importantly the fast charger is included right out of the box. The package is the same as you can find in their flagship phones which is 15 watts. If you compare to apple they provide a 5-watt wall charger with a 1000$ phone. So, bringing the fast charging support with USB Type-C to the M20 is something to be appreciated as not many devices come with this functionality in this price range. If the 10 Megapixel Primary Sensor at the back the Galaxy M20 coupled with a 5 Megapixel ultra wide sensor were taking ultra white photos. Samsung has beaten every Chinese company by the including this wide-angle lens because none of the Chinese phones has a wide-angle lens camera. So, Samsung has thought things through rather than just releasing for the sake of it. It also has Samsung’s new chipset. This is different than Samsung’s past chipset because two of its eight processor cores are of the Cortex-A723 variety (the other six are Cortex-A53 cores). Samsung has traditionally used chipsets with only power-efficient cores for budget phones, which was the main reason for the poor performance. But this chipset is gonna change that as Samsung says it will comfortably play resource intensive games like PUBG absolutely fine. The official prices for the Galaxy M10 are 112$ and for M20 is 155$. Quite impressive considering the value it provides and a series like this was needed for Samsung to be honest because Xiaomi overtook Samsung in the Indian Market with a market share of 28%. Hopefully, these new devices help Samsung to regain those lost customers. So, that’s it about the Top 5 Features Of Samsung Galaxy M20. 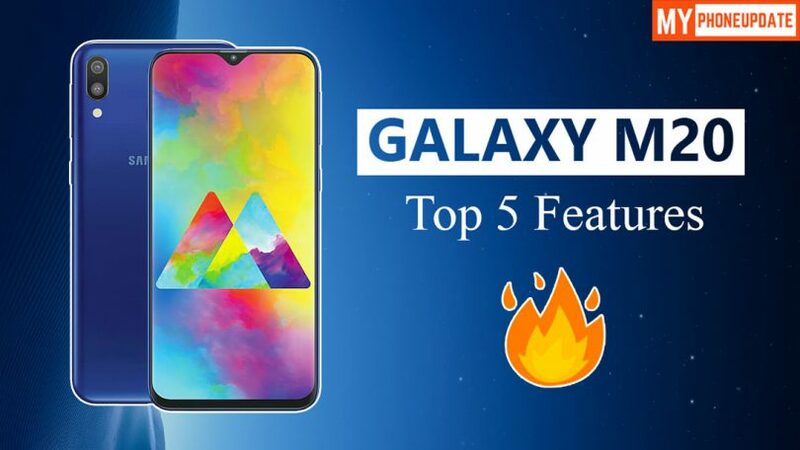 If you like this post make sure to share it on your social media and If you want to ask any question related to Galaxy M20 then make sure to comment down below. We would like to hear from you.